A car used by the former US Secretary of State Hillary Clinton received a ticket for parking for 45 minutes in London without paying. 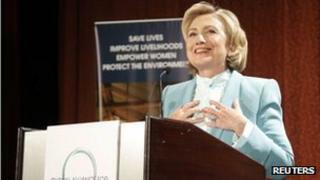 The £80 fine was put on the silver Mercedes as Mrs Clinton attended an event at Chatham House on Friday. Her security staff were seen discussing the penalty notice with a Westminster Council traffic marshal, but he refused to remove the ticket. A Westminster councillor said: "We have to be fair to everyone." Westminster City Council cabinet member for business Daniel Astaire said: "The former US Secretary of State was parked for nearly 45 minutes without paying. "I'm sure she will understand that we have to be fair to everyone, regardless of their status on the world stage." Mrs Clinton was awarded this year's Chatham House Prize in recognition of her contribution to international diplomacy and work on behalf of gender equality and opportunities for women and girls. She has not commented on the ticket. Parking charges: Money-grabbing or investment boost?